Aikatsu Friends! – 006 | Mezashite! I actually had a conversation (about Ema and choosing one of the new Friends girls) with a friend of mine that was almost exactly like this! This is quickly growing into my favorite Aikatsu…just don’t tell Ichigo and Ran! Would it be possible to make the subs compatible with a PS4? I would love to watch this show on a big screen instead of just my phone. Too many excellent idols to have decided a favorite yet, though I’m currently leaning towards either Maika or Karen (though that could simply be carry over affection from the voice actresses’ past roles). I’m feeling a kinship with Mio for now, though I didn’t meet my favorite Stars idol until the halfway point (Elza), so things can always change. It’s really nice to see the main cast link up so early in this series. In Stars, we had to wait for 24 episodes before everyone got together (18 if you count the movie). There are fewer characters total, which more or less puts it on par with the original Aikatsu’s pacing. Unless the writing takes a major step up, these six characters aren’t interesting or bountiful enough to power 50 episodes of Aikatsu-style entertainment, so more will probably be introduced midseason (~25-26) if not earlier. I don’t know what to think of the new series, they are going very fast with it, like they want to skip all the fat from the older series. Is it a sign that it might not last for very long? Either way, how can you expect me to choose a favorite idol when all I need is for Ema and Maika to become Best Friends? Bandai only ordered ~50 episodes (1 year) initially, as was the case with the first season of Aikatsu Stars. The franchise hasn’t been turning enough of a profit for their liking since the original Aikatsu, which is part of the reason why they keep rebooting it. Photokatsu is also kill because it wasn’t doing well enough. MONACA is holding a ‘Music of Aikatsu’ panel at Sunrise Fes in July, and two of their relevant composers have only been assigned to [email protected] as of late. There’s been no Friends movie announced, which is probably because it’s too financially risky at the moment. It doesn’t take a lot of brain power to realise they’re putting all they have left on Friends. Aikatsu will probably end for good if Friends doesn’t perform well or performs on par with Stars, which took an even further hit in popularity during its second season which is likely the reason why it was never renewed for a third. I’m not sold on Friends yet either, personally—I’ve found half of the episodes that have aired so far pretty mediocre even if fun, with 3-4 and 6 (this episode) having been the highlights for me. It’s the first season of Aikatsu I’ve had mixed feelings about. Up until now Aikatsu Season 2 (Dream Academy) was my least favourite, but I still felt it was on par with the quality of the rest of the series. Yet Friends feels like a major step down… or a step up, depending on your taste. It just feels very designed-by-committee to me and almost cynical in that regard, probably because Bandai is playing it safe. At this point, I’m honestly more interested in whatever Bandai thinks should fill the hole in demographic that Aikatsu leaves than Friends; I’d like to see Aikatsu’s spiritual successor. Judging by what I hear from my friends, Takara Tomy’s Pretty franchise is in a similar predicament. Funny you say that because that was AiStars for me. AiFure is actually fun and has nice genuine character interactions. It’s giving me a similar feel to OG a lot more than stars did, which works for me well. Also the CG being better is a plus too anyway. A shame to hear Aikatsu Stars wasn’t very popular. Do you (or anyone else) have any idea why that is? Personally, season 2 of Stars is my favorite era of Aikatsu to date. No idea, and I agree that Aikatsu Stars’ second season is great. I think it just didn’t connect with people, or that people are getting tired of the Aikatsu formula. It’s pretty unfortunate. I see what you mean. So far, it has neither the sheer energy from Aikatsu, nor the drama from Stars. It seems more based around comedy, which could work if they go all out with it. The idol anime genre was at its peak a few years back, but I guess those times are gone. Well, everything has a beginning and an end. AiStars drama wasn’t really great at all though. well, we really got to go back to the first Aikatsu!. Ichigo was done right how she grew and how she became stronger how she chased after Mizuki her story was done right each character story was done right and each character had the right amount of show time. I know there was some hate when it came to the last season when they switch the lead to Akari I was a bit hurt with this and refused to watch it but after a while I settle down and gave it a shot and I enjoyed it felt like Ichigo was now Mizuki and was teaching Akari so it went well it was like now Ichigo had Grown and even at the end they left with what I expected them to leave it with. Now onto Aikatsu Stars, it made a lot of mistakes first the movie was done way to early it left no real impact on the series with Aikatsu! movie it left with Ichigo becoming the top Idol and continuing the story with the series but Aikatsu Stars movie left nothing when it came to the show. The next Big mistake I saw was the whole strange power that was showing up they really never tried to discover what it really was they where like oh it’s a power that makes your unforeseen potential go full bloom and then they just threw it away and moved on. Now, this one is more for me the whole Elza storyline was just not really done well I mean like she comes out of nowhere and was like I’m perfect I got everything no one is better then me I’m just a perfect Idol end of story oh yeah I have mummy issues moving on. Now one thing that really got me angry was when they brought Ichigo and Akari into the show and was like oh look it’s these no-name Idols I mean like come on way to spit on the best series you ever had. Now onto Aikatsu Friends I have not gotten into this show yet I have not got into any of the characters yet they just don’t have anything going for them I mean like look at the other two shows with there story you had Ichigo and the Mizuki story line with Aikastu Stars you had Yume and Hime story with Aikastu Friends or I have seen so far is I come from a shop and I want to make a million friend umm okay then you have mio who just seems to be small Mizuki with how she wants to surpressed that two idol unit. I just don’t see anything to really attach me to the main MC characters and that is a Big thing if you can’t get into the main MC of the show then the show in my mind will not go so well. This is my opinion so don’t go taking my head off. Couldn’t disagree more, Friends has been 100% great from the start, mixing in long-term setups while taking aspects from Aikatsu that Stars ignored and spicing it all up with some new themes, and for now keeping a condensed cast to put high focus on few characters. Photokatsu ended likely because the signing groups are done and split up, not because of any reason relating to despair and hopelessness of it. Aikatsu continues to be a raising ground for voice actresses, CG animation, and music composition. Only a fool would look at Friends and see even a hint of overproduction. There’s every bit as much love put into this series as every one before it. 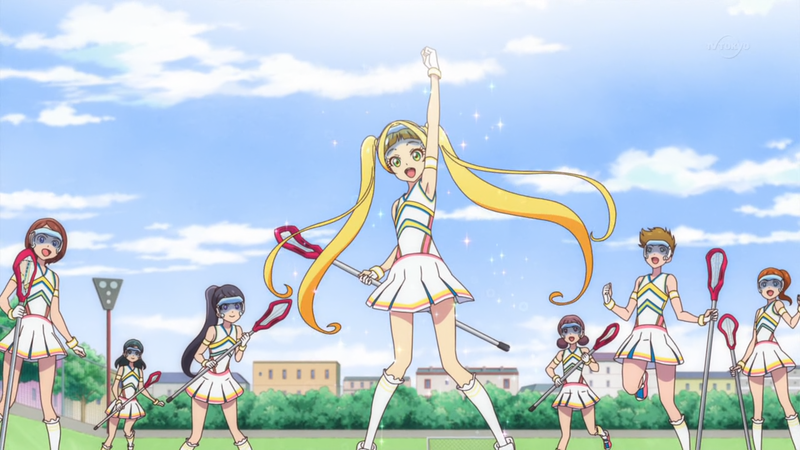 And if you think it’ll ever end, you need only look at Precure now past its 15th anniversary and still going strong, or its direct rival PriChan, now branched off into the usual girl idol anime and now KoP on the side to rake in the fujo dollars. I definitely respect your opinion, and I’m for the most part inclined to agree, but I just need to give it some more time before figuring out if it sits right with me. Honestly, the only reason I’m criticising Friends is out of love for the franchise; if it didn’t mean that much to me, I wouldn’t care either way. It’s only a matter of the franchise going from ‘good’ to ‘decent’ for me. I probably shouldn’t be complaining. Interestingly enough, the Precure series also supposedly had it’s ‘make or break’ series in the 6th year with Fresh. If Aikatsu! wanted to follow the same formula it would move into rebooting each year from now on. Just saying. I think I’m pretty late to take the Aikatsu train, so, do I first need to watch Aikatsu and Aikatsu Stars to fully enjoy this animu? Well, Aikatsu Friends has the best things from both previous series, so you can watch it without worries. Not to sound rude, but I’m honestly just curious as to when ep 7 will be released? I can’t find a schedule so I honestly don’t know. (I’ve noticed it was being posted on Sunday and sometimes Saturday, but I guess I was wrong) Again, sorry if me asking is a bother, but I am just honestly curious. Thanks for posting this anime with subs and all the work that goes into it.